Care packages have their origin in CARE, an organization which was founded in 1945 to help restore nations battered by the Second World War. CARE sent millions of packages to war-torn Europe with urgent supplies like food, clothing, and medications as well as books, toys and recreational items. The goal was to make the recipient’s life a little more pleasant by providing both vital necessities and comfort, along with a kind word from home. 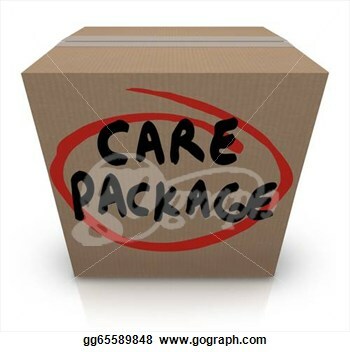 Care packages come in all sizes and shapes and may include an array of items. They may be sent to a variety of recipients including the military, hospital patients, college students, the needy and even missionaries to name a few. Have you ever been the recipient of a care package? I have, and it changed by life! I was the recipient of a care package from God! He knew what I would be facing on that specific day and what I would need to hear – that He cared. Jane was sensitive to the Holy Spirit who impressed her to write exactly what I needed to hear in exactly the time frame that it needed to arrive. It was a God thing! I had read 1 Peter 5:7 many times and understood it on an intellectual level. However, on that day those words moved from my head to my heart and I now had heart knowledge – the great God of the universe cared about me! The Merriam-Webster dictionary definition for care package states “A package of useful or enjoyable items that is sent or given as a gift to someone who is away from home.” How appropriate! This world is not our home – heaven is. God desires to send us care packages to encourage us on our journey. Truth to Claim: God cares for you. Application: Anticipate receiving care packages from God. Allow God to use you to provide a care package for someone else.